As we all know Pokemon go introduce new Pokemon it has been two years since the Augmented Reality game Pokemon GO was released on iOS and Android and now its creators Niantic, the company which was once a part of Google have released crafty artwork which features trainers with some of the newer generation Pokemon, upon further looking it was clear that those Pokemon belonged to Generation 4 especially the starters. 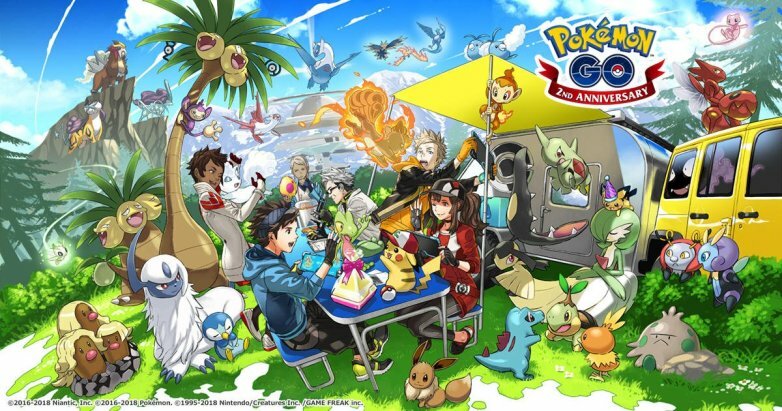 Although Niantic has not officially announced anything about any new release, some of the Pokemon in the artwork has not been part of the game which suggests heavily that those Pokemon would be introduced soon. It includes the Gen 4 starters like Chimchar, Turtwig, and Piplup. All three of those were also introduced in the 20 years long animated series in the Pokemon Diamond and Pearl season. Over the course of two years the developers have rolled out the first three Generations so we are almost bound to get Gen 4 and the newer generation Pokemon down the line but out of those three only Generation, 1 ones have been fully introduced. On their Twitter feed, Niantic has asked the users of their most memorable moments playing the game during the course of two years as the Pokemon GO Chicago Fest is taking place in the United States which is sponsored by the developing company itself. While the previous event in 2017 was a proven disaster yet for this year Ten Thousand tickets were sold within nine minutes of the launch on the website which proves the game is far from dead as was speculated back in late 2016 by many and still has life. It might come as a surprise but the game alone in the North America region earns a whopping $2 Million a day. With the mainstream event happening in Chicago this should not be considered a coincidence and expectations are pretty high for players around the globe for a new Update. As an Electrical Engineer i was instantly attracted towards all the latest tech and games.Here to write from a perspective of a fanboy which mesmerizes the mind with all the advancement happening around.